In the sporting world you get the impression that there's nothing that a bright terrier cannot do - with tales of their prowess as stand-in gundogs and part-time hounds abounding. But their wide repertoire embraces other little-known skills too. The leggy ones ran with the hounds; the nearly leg-less ones powered the turnspits in commercial kitchens. But their talent for finding truffles is largely unacknowledged - and today, mainly on the Continent, truffles are very big business. 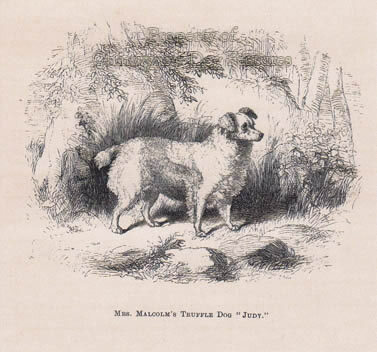 In his celebrated book Dogs of the British Islands of 1878, 'Stonehenge' alias JH Walsh, writing on truffle-hunting dogs, describes them as poodle-like but illustrates his piece with what is very much a terrier-type. He wrote: " These dogs...have exquisite noses, and hunt close to the ground...at the spot where the fungus lies buried, some two or three inches beneath the surface, they dig like a terrier at a rat's hole." Digging is not however second nature to a poodle! Walsh described the dogs as weighing about 15lbs, white or black and white, or solid black, sharp and intelligent. Other illustrations of them depict a dog with a waterproof coat, often curly and close-fitting, suitable for a dog spending a great deal of time out of doors. Truffle-hunters were gypsy-like and lived literally close to the soil. 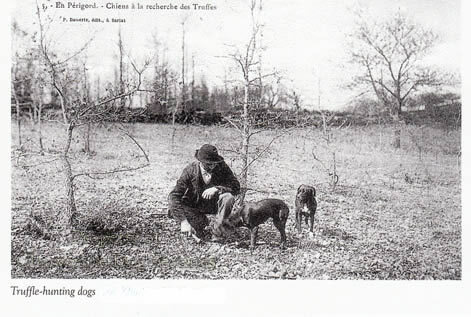 In those times, those who used dogs bred for performance not purity of race, so there was always a distinct mongrel look to the truffle-hunting dogs. Their coat texture gave Victorian writers the idea that they were more like water-dogs, as Dalziel noted in the middle of the 19th century: “They appear to be a dog with a considerable amount of Poodle blood in them, with a dash of Terrier of some kind. Their work is to find where the truffles lie buried, which demands a keen nose, much perseverance, and considerable intelligence. 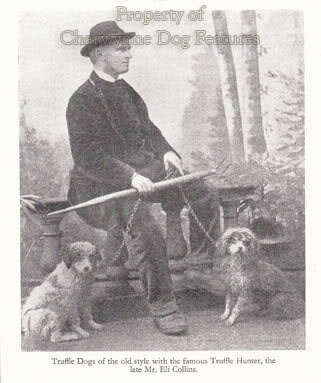 They are trained to this work, being carefully broken from game, and by their cleverness form the main support for many families.” His words reveal both the admiration for a talented type of dog and the unease of such educated sporting writers when covering a function and a type of dog unfamiliar to them. Hunting the truffle in England was conducted by the humbler hunter, men who valued a dog for what it could contribute to their family’s well-being, with scant regard for consistency of type or any distinct breed. 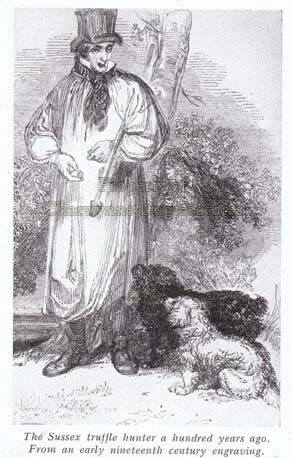 To be fair to Dalziel, he did go on to write: “As they do not come under the category of exhibition dogs no scale of points has been drawn up of the breed, their owners being only anxious to develop in them those qualities by which they assist them in their labour, without paying regard to external appearance.” It could be argued that it has been, for over a century, that too much regard for external appearance has led to the decline of the domestic dog. All over Europe in the middle ages, hunters made use of small waterproof-coated easily-trained dogs, with a remarkable sense of smell, to locate wildfowl and retrieve not just shot game but the projectiles which brought them down: bolts and arrows – for subsequent reuse by the hunters. These clever immensely capable dogs, were the predecessors of today’s poodles, and are perpetuated nowadays by recognised breeds such as the Barbet in France, the Lagotto Romagna in Italy, the Wetterhoun of Holland and the water dogs of Spain and Portugal. The strong noses of these talented dogs led to their use in other demanding searches, especially in the pursuit of truffles, where a discerning nose and, as Dalziel states, much perseverance, brought rewards to their owners. In France too, small hounds were utilised, those with exceptional noses; pigs were tried too - but they invariably ate the truffles once detected! Terriers with their keenness to dig would have found a role here. In its heyday, truffle-hunting enjoyed royal patronage, there are records of Queen Victoria having two truffle dogs in 1842. These dogs were associated most with the counties of Wiltshire and Sussex, where the ground conditions allowed cultivation of the crop to succeed. 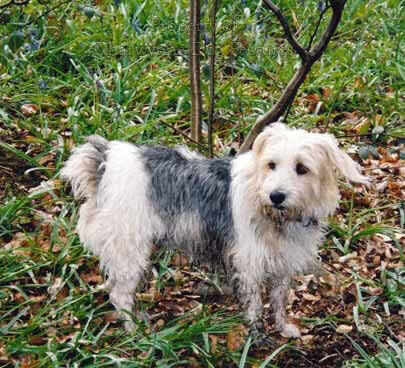 Similar ground conditions exist in the Piedmont district of Italy, where the dogs are said to resemble a blend of Fox Terrier, Brittany and Poodle, and Sonoma County in California, where 'the black gold' as truffles have been dubbed, were detected by hybrid terriers, sometimes with hound blood. In Britain, we seem to have given up on this remunerative pursuit around 1920, probably, as with so many costly items, preferring to import them. In the 18th century, Gilbert White, in his famous The Natural History of Selborne, describes truffles as sometimes lying two feet under the surface - now that's terrier country! Is there a modern employment for terriers here - certainly an emergent breed like the Sporting Lucas Terrier would fit both the type of dog used and the ground scenting skills required. This could prove rewarding: work for the dogs and funds for their owners. But there is a risk that they could end up being called 'truffle dogs' and that doesn't sound very complimentary!